Following stablemate Volvo Trucks’ success with the I-Shift, Mack Trucks presents its own version, mDrive, in 2011-model Trident and Granite trucks. Gary Worrall drove a Trident Axle Back from Townsville to Brisbane. 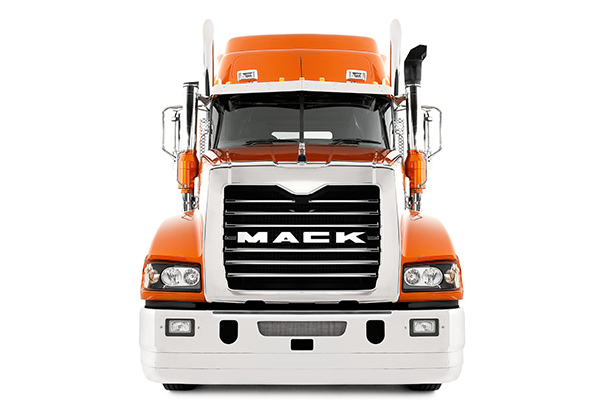 The Mack Trident makes use of a lot of new technology to improve performance, safety and comfort. Having said that, much of this is hidden from view. The latest version of the Mack Trident, a solid enough prime mover launched as part of Mack Trucks' New Breed range at the end of 2007, complete with a national road tour and some of the best paint jobs ever to grace a truck - either factory or aftermarket. Sadly for Mack, this did not translate into immediate sales leadership due to a variety of problems, both internal and external, that saw the once mighty bulldog chained in its kennel as other brands staked their claim on the local market. In 2011, that's all a distant, if harsh, memory. 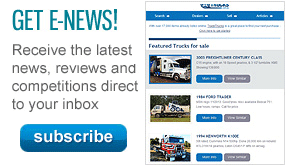 The bulldog has again been unleashed on operators around the country, with a range of good-looking and, more importantly, well-performing trucks. Mack's repositioning in a bid to become 'top dog' in the bonneted category once more is helped by a timely and much-discussed raising of the exhaust emission bar by way of ADR 80/03, which allowed Mack engineers to fit a host of goodies that have been steadily accumulating in the company's factory at Wacol, on Brisbane's outskirts. While the bigger trucks have only been granted a brief wave of the upgrade wand, in the form of improved emissions technology, rather than the introduction of anything really spectacular, by contrast, the 'mid-sized' (everything is relative in the heavy duty category) Granite and Trident benefited most from a visit by the upgrade fairy. Having received a significant facelift for the 2007 New Breed launch, the external changes to the Trident are minimal, and are mainly a result of the move to ADR 80/03. The most visible alterations in this case are the addition of a 150-litre AdBlue tank, now that the MP8 has gone selective catalytic reduction (SCR) for emission reduction, as well as the distinctive setback of the front axle that gives the variant its name. Otherwise, there's plenty to keep the Mack traditionalist smiling, including a square grille housing 9,258 square centimetres (1,435 square inches) of radiator, sufficient to keep the MP 8 running cool in all manner of operations. As well as looking pretty, the expanse of chrome strip will ensure operators are never left without anything to do. Keeping the brightwork surrounding the radiator, on the exhaust and air intake stacks, as well as the polished fuel tanks and alloy front bumper will add up to hours of fun - and if that's not enough, the side steps to both the cab and the work platform behind it will also need to be kept shiny. At least the perforations for removing mud from the driver's boots are easy to clean with a pressure cleaner. Proving that good looks can be functional at the same time, Mack has strengthened the mounting for the bulldog bonnet mascot, allowing it to serve not only as a link to previous trucks, but, in combination with the notch in the front bar, as a handle for pulling the bonnet forwards and down. Despite, or perhaps because of, the axle-back design, the one-piece bonnet and guards run immediately into the wheel arches, with a number of swage lines formed into the panels to help direct the airflow around the main protuberances and into the engine bay to help with the cooling task. The bonnet slopes forward, not only reducing the frontal area for air penetration but improving the field of view, which can feel reduced if drivers aren't familiar with bonneted trucks. The sides of the bonnet are fitted with vertical flutes that not only look good, but also provide an exit point for some of the heated air drawn in through the grille and across the radiator, directing it sideways and out from the cab. The windscreen is another piece of tradition, with split screens joined by a vertical strip. Unlike older trucks, the screens curve to meet the A-pillar, which also contributes to good forward vision. The axle-back offering certainly presents a strong visual. There are plenty of links to past models but swooping lines over the wheel arches and integrated wrap-around lighting assemblies save it from looking like a museum piece. A revision of the trusty Mack MP 8 engine has transformed it from pleasant to potent. It now packs up to 393 kilowatts (535 horsepower) into its 13-litre inline six cylinder engine, as well as a more-than-useful 2600 Nm (1920 ft/lb) of torque. The Mack Trident is the long-awaited debut of the mDrive transmission, a 12-speed direct drive automated manual, where a computer controls the clutch and the actual gearshift (though the driver can manually shift gears where necessary). 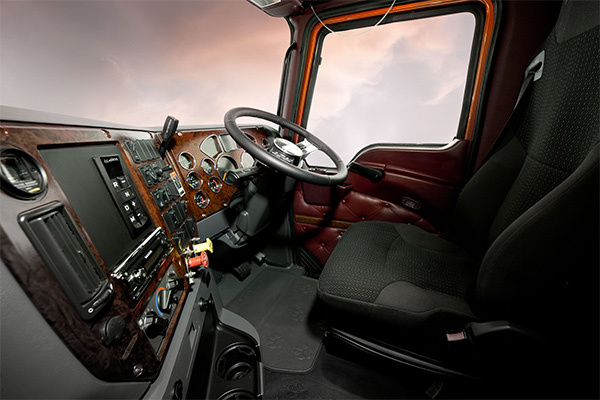 Where, in the past, it was not uncommon for the cab to be drafty and noisy, Mack has put in plenty of effort to improve driver comfort, and it's evident from the moment you open the door. 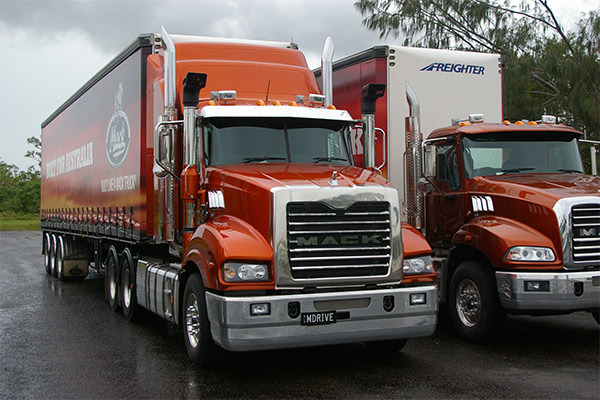 Understanding that many of their trucks operate in dirty and dusty environments, Mack has fitted thicker and longer door seals that form a solid seal with the external wall of the cab, keeping out a tremendous amount of noise and dust, as well as allowing the air-conditioning unit to maintain the preset temperature. In fact, the seals are so good that the windows should be wound down slightly to reduce the internal air pressure and allow the doors to shut without being slammed, the same technique used in top-shelf luxury cars with similar sealing qualities. This was proven on the test drive when, after five attempts to close the passenger door, it closed instantly, and easily, with the window down about two centimetres. Although the door only opens to 75 degrees, there is plenty of room for entering and exiting. It did take some getting used to using the door pocket as a third contact point but I am assured that it has been engineered to withstand over 150kg of force. The steps are well spaced, with two recessed into the fuel tank and the top step running the length of the tank, making it easy to reach across the windscreen while scraping off the dead bugs, to quote the great Elwood Blues. The Trident cab offers plenty of room. The test truck had the optional pleated roof trim. Owners get a choice of burgundy or slate grey - both are visually appealing and fit well with the rest of the cab. 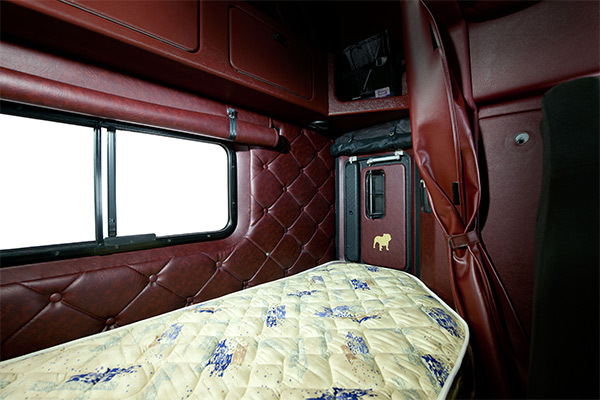 For operators used to three pedal manuals, mDrive may take some adjusting to, but there will be no complaints about the extra room with the gearstick removed, which provides a flat floor to step from the driving seat to the sleeper bunk. Unfortunately, the cab roof height remains at the standard level, so taller drivers (190cm in boots) still find themselves bent over as they shuffle around the cab. The bulk of the centre console also precludes the fitment of a left side foot rest. However, after well over 1,000 kilometres behind the wheel, there were no problems with cramping, thanks to the flat floor. The sleeper bunk also housed a slide-out refrigerator. While not huge, it certainly had no problem storing enough drinks for two, plus the odd snack, and, best of all, the handle is placed so that the driver can drop their left hand and slide the tray out without looking away from the road. There are also overhead storage spaces big enough for a work diary, with elasticised net restraint to stop things lobbing into your lap while you're driving and two drink holders that can cope with anything from a one-litre water bottle to a large latte with a shot of butterscotch. The test truck used the premium Isringhausen 'Big-Boy' air ride seats, complete with Mack embossing for the cloth trim, along with tri-level lumbar support, left-hand armrest, forward and backward seat cushion adjustment, air-controlled height adjustment, but most importantly, plenty of support and comfort, for the 'big boy' driver. The steering wheel is also air-adjustable for height and reach, which offers virtually an infinite range of adjustments and positions to suit all drivers. Mack driver trainer Paul Munro provided a briefing on the controls after I'd made myself comfortable in the seat. While most of them are clearly marked and in familiar positions for anyone experienced with Mack trucks, Munro demonstrated the mDrive placement and layout, as well as the cross-linked functions of the cruise control and engine brake, or Power Leash in Mack-speak. 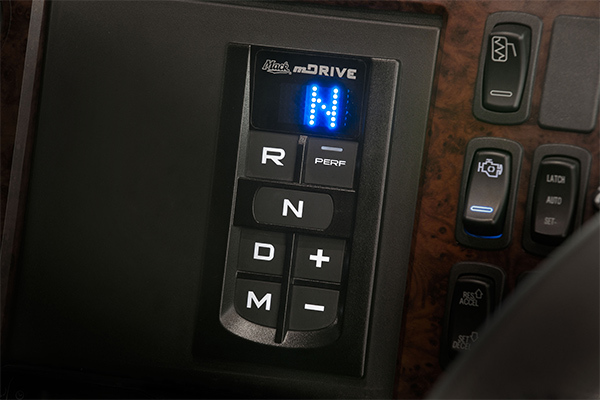 In the Trident, the mDrive panel resembles an automatic transmission, with buttons for drive, neutral and reverse, a manual button with 'plus' and 'minus' for manually shifting gears, plus a 'performance' button to encourage the computer to hold gears longer when needed. True to American style, the majority of switches are on a panel to the left of the steering wheel, including the park brakes, transmission controls, air-conditioning and audio system. Personally, I'm not a fan of the diamond-shaped pull-push switches for the park brake. After using stubby levers in other trucks, it feels odd to reach for the dash panel - particularly if it is urgent. Another concern is the placement of the ancillary gauges to the lower left of the steering wheel on a flat panel. With a number of gauges, including exhaust and drive axle temperatures, concentrated in the one area, the driver must look away from the road to scan the dials and ensure everything is operating normally. The main console is clear and uncluttered, with large dials for road speed and engine revolutions, as well as the co-pilot display panel, which is accessed through a thumb switch on the right hand column stalk. This can be programmed to display a variety of information including trip data, fuel consumption and driving hours, as well as total running hours. After an extensive familiarisation session with Munro, it was time for me to take the wheel of the big Mack (actually it is more of a 'quarter pounder' compared with the Super Liner, a true big Mack) and head south for Brisbane from Townsville. The road trip had rather thoughtfully been planned to coincide with the end of the wet season, but as we took to the sodden Bruce Highway under wall-to-wall cloud, there seemed no end in sight - the sort of weather that grounds aeroplanes but is seemingly de rigueur for the transport industry. The upside is that the rain gave the Trident - an appropriate name for the conditions, given that it's the weapon of choice for Neptune, King of the Seas - a chance to establish its all-weather credentials. Having most recently driven a string of cab-overs it took a little while to find my rhythm behind a bonnet, but, as Munro had suggested, I lined up the road shoulder and held my line using the mascot - another reason why the bulldog can be called man's best friend. General visibility, despite the inclement weather, was good, with the windscreen wipers sweeping clean a good-sized segment of glass on each movement, although it took a little time to adjust to the multi-position toggle switch that gradually increased the tempo of the wipers from laid-back soul to a frenetic John Bonham-paced sweep. Ergonomically, aside from the concerns raised previously about the placement of some gauges, the Trident is well thought-out, with switches and buttons all within easy reach of the driver. If there is a complaint, it would be that the buttons on the stereo system are on the small side, making it easy to bump the wrong one initially, although this was less of a concern 1,000km into the drive than it was at first. As someone more accustomed to Euro and Japanese trucks, I found the door mirrors to be a step back in time. Although they offered a good view of what happens down the sides of the combination, it always felt as though the view could have been better. However, I stress that this is purely a personal perspective. While not offering the same level of ride comfort as Volvo, its European cousin, the Trident still quickly revealed itself to be a steady on-road performer imbued with decent manners and a solid ride. Despite the best - or worst - the Bruce Highway could conjure up, including ruts, potholes and the odd canyon in the road surface, the Trident was never flustered and rarely unsettled to the point where the bumps made it all the way to the air-suspended cab. Pulling a single trailer with an all-up gross of around 41 tonnes depending on fuel load, the Trident took it all in its lengthy stride and continued to roll on. Compared with earlier model Macks, the in-cab noise levels are a revelation. With two up, holding a conversation was simple - even if it was mostly my trainer Munro whimpering about driving standards among journalists (I'm told he's responding well to treatment). The work done to improve sound deadening has paid off, with the MP8 engine audible without being intrusive, settling down to an aural backdrop, particularly with cruise engaged. The liveability of the cab is also assisted by the wise choice of numerically lowering the final drive ratio, so that the engine was running at a lazy 1500rpm at 100kmh, which will also win friends when it comes time to refuel. A combination of the trip computer not being reset after filling the tanks, the newness of the engine (less than 15,000km old) and multiple drivers made it hard to establish useful consumption data. 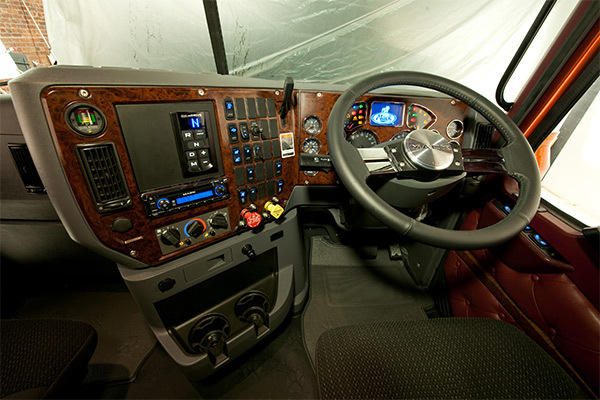 However, the computer did spit out an average usage of 41 litres per 100km at the end of the run, although this should improve with a regular driver familiar with the Trident and its automated transmission. Due to the newness of AMT technology to many drivers, Munro says one area he stresses is that mDrive is not an automatic transmission and drivers should not attempt to pre-load the transmission before driving off, as they would a torque converter, since, in the case of the mDrive, although there isn't a clutch pedal, the clutch remains but is controlled by the computer, which interprets throttle pressure as the signal to drive off. It will then begin to engage the gears, even if the brakes are still applied, with the result the clutch will wear out prematurely. A hill-holder function will be added to the transmission in the second half of 2011 - the date is yet to be set - which will overcome this. It will automatically apply the brakes when the truck comes to a stop with the transmission engaged, and then release them when the throttle is applied. 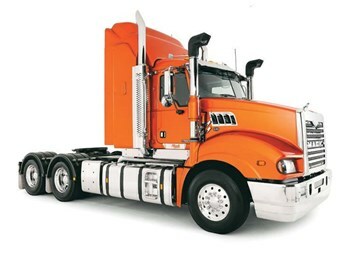 This system is used by virtually every other truck manufacturer offering an AMT option and eliminates the problem. The mDrive is a simple unit to use, with the driver able to simply engage the computer at the start of the trip and not touch the controls again. For best results, Munro teaches operators to set the engine brake to automatic and then engage the cruise control for constant speed operations. This also allows the overrun speed to be set, which provides a 3km/h differential to the cruising speed before the computers will progressively engage engine brake and downshifts to regulate downhill speeds. Despite this, drivers should always pay attention and not feel bad about using the brakes, as the main drawback of AMTs is the inability to see the corner ahead or the slow moving vehicle in front of the truck. While long-term manual drivers may argue the point, the reality is that mDrive will handle the truck more efficiently over the course of a journey than even the most experienced and intuitive driver. No human can consistently match the speed and accuracy of the gearshifts, while the computers are programmed to use the engine's torque and power curves to extract maximum efficiency from the drivetrain. If this sounds like the plot line to sci-fi movies like Terminator where machines take over the world at the expense of humans, fear not. The driver always has the last word, and there are times when this is necessary. 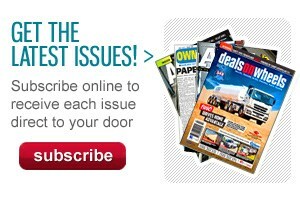 But for best average performance, why not let the machines take the stress out of driving? Mack is right, the Trident is not a challenger to the premium European trucks, but then it is never intended for that role. Instead, it is what it is: a competent, bonneted alternative for single trailer and B-double operations and, for a first attempt at bringing hi-tech into a category not known for European-style technology, it is a good effort. More importantly, given some experience and extra customer feedback, the Trident will only get better, which bodes well for the future of the bulldog breed down under. Where is the hill holder?